Roast in the oven for about 30 minutes until onions are caramelized and chicken is golden. While the chicken is roasting, cut out the tree stem of the Swiss chard. Saute seperately until soft with a Tbsp of olive oil. Boil water for pasta, cook the pasta. Save a cup of pasta water and mix it with the leftover pieces of vegetables stuck to the parchment paper. This creates a glaze for the pasta to ensure that it will not dry out. Combine chicken and vegetables with the pasta, the pasta glaze, and the Swiss chard. 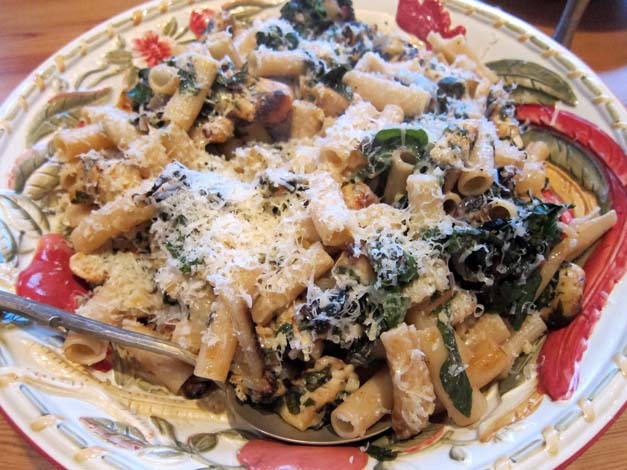 I had so much Swiss chard from my garden, and I needed new ways to eat it, so I resorted to an old favorite: pasta! This recipe is simple, delicious, and I use gluten-free pasta so that Jim, who has celiac disease, can eat them too. TIPS & SUGGESTIONS: Using parchment paper on the baking sheet makes your work so much easier. The vegetables and chicken will not stick to the sheet, and it will be simple to remove them.